With the end of the year almost upon us, it’s time to recount RRWPC’s accomplishments, count our blessings, and look to the future to see where we go next. For the last 35 years, RRWPC has served as an articulate voice for protection of the lower Russian River. We have carefully studied the issues, respectfully spoken truth to power, and continued to maintain our independent voice on behalf of the river environment. Santa Rosa leaders and the Press Democrat have openly acknowledged RRWPC’s significant role in removing Santa Rosa wastewater discharges from the river. This last year we have written numerous articles for the Sonoma County Gazette on urban water supply and drought, Regional Water Board pathogen studies and anticipated septic rules to come, and problems with urban over-irrigation of wastewater and inadequate regulation of toxins in wastewater (see website http://www.rrwpc.org). To substantiate irrigation runoff, we have gone out on many occasions to photograph its occurrence in Santa Rosa and Rohnert Park. We have urged the Regional Board to take strong action against repeat offenders and they are currently working on the issue. It is noteworthy that wherever we saw irrigation systems turned on, runoff was occurring. Gazette articles read far and wide…. Our Gazette articles are being read far and wide. Newspaper circulation is up to 34,000. We have received many complements on our work and in fact have heard of its distribution by Department of Water Resources and several County Agencies. We take pride in the level of professionalism in our writings, and while some people may disagree with our point of view, it is our impression that all respect our work. We have worked with other water activists on the Sonoma County Water Coalition and helped support many important water protection actions. We have tracked Sonoma County Water Agency’s eight major water contractors and their water use during the drought. We continually provide testimony on discrepancies between Contractor progress reports on their conservation accomplishments and actual contractor water sales, reported on SCWA website for the last 20 years. We continue to read and study important documents that are released on important river issues and subsequently often provide written and verbal comments to agencies involved, as well as elected officials making decisions on the topics of concern. Estuary Project Settlement Terms moving forward…. We continue to track terms listed in our Stipulated Settlement Agreement with Sonoma County Water Agency resulting from our legal action on the Estuary Project. Very soon, there will be many new seal protection and visitor safety signs at Jenner and North Salmon Creek Beach as a result. 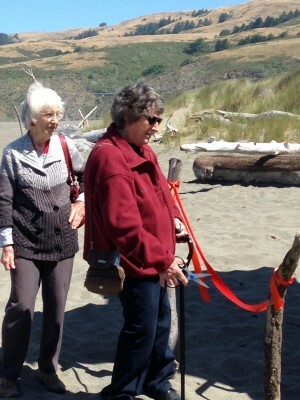 By the time you read this letter, we hope that four trails at North Salmon Creek Beach will be repaired and rehabilitated as a result of our effort. RRWPC has paid close attention to scientific developments in the field of toxins and endocrine disruption. This field is burgeoning with discoveries about all the many toxins in our everyday lives. These unregulated toxins have been found in our lakes, rivers, streams, drinking water, and wastewater. They occur in many of the household and personal care products we use, and they can be harmful, especially to children, at extremely low exposures (parts per trillion in some cases). RRWPC thanks our supporters this holiday season…. This is the time when we thank all who have supported us this past year, including our Board of Directors (Sherrie Althouse, Nichae Blume, Dave Blanchard, Dennis O’Leary, and Brenda Adelman), our numerous mailer volunteers, and all of you who contribute to sustain our efforts. We thank Russian River Senior Center staff for allowing us to use their space to assemble our mailers. We thank Mary Anne Sobieraj, Rick Ganns, and Dave Blanchard for website creation and upkeep and Mark Wiley for helping keep our computers functioning smoothly. We also thank publisher Vesta Copestakes of Sonoma County Gazette, for regularly publishing our articles. Vesta has also contributed in-kind donations of her graphic skills to RRWPC, as exemplified by the enclosed donor list. We also thank Denny and Patty O’Leary for help getting our papers and storage unit in order and especially thank Sherrie Althouse for serving as our treasurer for many, many years. The enclosed donor list acknowledges those who gave $20 or more between November 1, 2013, and October 31, 2014. RRWPC is grateful to all for your loyal support, which clearly demonstrates how much you care about our work focusing on Russian River protection, and making it possible for us to sustain our efforts. Donations coming in after Oct. 31st, will appear in next year’s donor list. 2014 promises to be a busy year for RRWPC…. RRWPC will be following many critical issues next year including: the Fish Flow Project EIR (i.e. permanent lowering of minimum river flows), septic regulation issues, especially as applied to lower Russian River, new water quality studies on bacteria and nutrients, nutrient credit trading, mandatory conservation policies needed to protect summer flows. If we don’t have major rainfall this winter, drought will be an escalating concern. We will also track Water Agency’s Urban Water Management Plan that will explain how limited water supplies will provide for contractor growth projections. Finally, we will continue to track problems of over irrigation with wastewater. Please join our action email list!Those who already shared their email addresses with RRWPC are participating in our action list and receive important announcements on issues coming up between mailers, such as sending letters of support when time is short. We do not share email address lists and use them infrequently for important announcements and calls to action. If you would like to take part, please put email address on a donor card if you are sending in a contribution, or just send an email to rrwpc@comcast.net asking to be on list. RRWPC anticipates taking on numerous challenges next year. We need your continued support and appreciate donations of any size. Since we cut back the number of our mailers from six to four, we experienced a drop in revenues and need your help more than ever. Please pass this information on to other interested parties. Contact us at rrwpc@comcast.net for further information. We also invite you to join us at a RRWPC benefit Christmas sale of beads and handcrafted jewelry as noted in the small flier. We hope you will visit our event.